"A must read for anyone starting or managing a business." Q1: Why did you write Finance Without Fear? We feel that finance is critical to starting and operating a business. But finance is not well understood by many business people and is not explained well in many classrooms. Instead of understanding finance, people are afraid of finance. Q2: Why are people afraid of finance? There are two reasons people tend to be a little bit mystified and afraid of finance. First, some people are very uncomfortable with numbers in general, and then when you start talking about finance people tend to immediately assume that since it’s numbers, they won’t understand it. This leads us to the second reason, the way finance is typically presented. Finance is often presented in what we call “accountant speak.” It's presented using lots of terminology that's not really defined, and is often presented without any links to or real-world businesses. People end up afraid of finance not because it's a complicated subject, but because it's presented in ways that make it appear much more complex than it really is. Q3: How do you remove the fear finance? In Finance Without Fear we've used three different techniques to make finance more understandable. First, we explain the basic concepts of finance and financial statements using consistent terminology. We've attempted to remove as much of the accountant speak as we can from the book. Second, we use the story of the startup and growth of three companies throughout the book to explain how finance works. You get to see how finance works through the eyes of these companies. Finally, rather than just presenting finance as a series of calculations, we've provided a lot of comparative information for different businesses so that you will be able to look at your business in the context of others in the same industry. Q4: Can you succeed in removing the fear of finance? We think so. We've worked with many students in graduate and undergraduate finance classes, worked with small businesses, and boards of directors. We have been successful using the techniques in this book to explain finance and allow them to come away with a much clearer understanding of how finance works and how finance can be used to create and manage a profitable business. Q5: Who is the target audience for Finance Without Fear? Finance Without Fear will be very valuable to an entrepreneur who is planning a new business, or is in the early stages of building a business. We also think the book would interest the owner or manager of existing businesses who need to understand how to grow the business or keep it profitable in tough economic times. Finally, we think that Finance Without Fear will be a great resource for college students who need a basic understanding of finance but are not finance majors. Q6: Do you need an MBA to understand the book? No. The book is designed for people without MBAs. It is designed for the average small business person or the college student who needs to understand finance. It’s a great supplement to the text in many MBA finance classes. Q7: What happens if I'm running a business and don't understand finance? We believe that it's very important that business owners and managers understand finance. Finance is the lifeblood of a business. The two most important things in any business are to generate enough cash from operations to pay the bills, and to make a profit. Understanding finance is the key to understanding the cash flow of the business, and is key to understanding whether the business makes a profit. A business that has the cash to pay its bills and that can generate a profit, should be able to pay a financial return to the owner and be in business for long time. Q8: In Finance Without Fear, you have built the book around several sample companies. Tell us about these companies. One of the things that we've interwoven into Finance Without Fear is the story of three companies. In the book, we use the story of these companies as we demonstrate how financial statements work, how businesses startup and grow, and how to analyze the competitive advantages of a business. One of our sample companies is called Bonnie's Beachwear. Bonnie's Beachwear is a retail store set in an Art Deco building across the street from the beach in Miami's South Beach neighborhood. As a retailer, Bonnie’s is a great example of the type of business that many people start. Our second sample company is Boutique Handbags, a manufacturer of high-end stylish women's purses and accessories. With Boutique Handbags, we talk about the process of evolving a business from the owner’s kitchen table to an industrial park. Our third sample company is Uptown Chiropractic, an example of starting and growing a professional services business. Q9: You talk a lot about competitive advantage in the book. What does finance have to do with competitive advantage? In the book we talk about the different strategies of business can use to obtain competitive advantage. Then we talk about some of the tools that can be used to measure the effectiveness of these strategies. For instance, businesses that pursue customer focused strategies, such as customer service, sales and marketing, or research and development, need to spend some money pursuing these strategies. Their operating expenses will be higher than in a business that skimps on these things. It's pretty easy to tell from looking at the financial statements how successful a company is using one of these strategies. Likewise, you can also see how effective an operational centric business can be in being a low-cost provider in the market. In Finance Without Fear we give you the tools not only to analyze the effectiveness of your own business strategies but also to understand what your competitors are doing, and what the industry is doing. Q10: I don't know anything about finance, what will I learn by reading Finance Without Fear? I think of four key things that someone would learn by reading Finance Without Fear. First, we explain the three key financial statements, the cash flow statement, profit and loss statement, and balance sheet. To understand finance, it's important to understand each of the statements. We also present some financial analysis tools that you can easily use to analyze the critical parts of your financial statements and those of your competitors, and spot trends are affecting your business. In addition to presenting the financial analysis tools we also provide a lot of information about how to interpret this information. This is a big difference between Finance Without Fear and other finance books. Most finance books tell you how to perform the calculations but don't tell you what they mean. In Finance Without Fear we took the next step and give you comparative information to help you understand what's going on with your business. Finally, we've included how to project the cash needs of a start up or growing business, and on what lenders and investors want when they look at your business. Q11: If I've already been running my business for many years, is there anything new I might learn if I read Finance Without Fear? We believe that even experienced business owners can get some valuable information for Finance Without Fear. First, we've included an extensive discussion of margins and cash cycles for many different types of businesses. It's always a good idea to get an understanding of how you stack up to the competition. Also, growing a business requires a significant amount of additional cash, and we've included lots of information about how to evaluate the cash needs of the business when it's in growth mode, and how to evaluate the profitability of different growth strategies. Q12: If I'm taking a finance class and the professor has assigned a big, expensive finance textbook, will I get any value from reading Finance Without Fear? Absolutely. One of the big issues that we've seen with many finance textbooks is they tend to explain many esoteric concepts, but do not relate the material to the real world. That's one of the reasons that we integrated the story of our three sample companies into Finance Without Fear. We want the reader to be able to not only see the concepts of finance but also be able to see how these concepts can be applied to their company. We think of Finance Without Fear as an important supplement to the traditional finance textbook. Q13: If I was looking at a business for investment purposes, would Finance Without Fear help me with this as well? Definitely. One of the keys before you invest in business, whether it is an investment with your brother-in-law, or an investment in the stock market, is to understand the financial statements and strategies of the business. Finance Without Fear includes a series of tools that can help you understand how profitable the business is, how quickly or slowly its getting paid, whether it can afford to make its debt payments, and what return it has been generating for its owners and investors. Q14: There is a companion workbook to Finance Without Fear; what's in the workbook? When we were researching Finance Without Fear, one of the things that was mentioned frequently by people who had started a business was that the traditional textbooks and classes never told you how to put financial projections together for business. So, when we wrote Finance Without Fear, one of the goals was to provide a step-by-step guide to actually developing financial projections for a business. This evolved into the Finance Without Fear Business Forecasting Workbook. The workbook contains not only the step-by-step instructions but also access to the Business Forecasting Model, a hands-on tool for developing financial projections. Q15: How can the Business Forecasting Model help an entrepreneur develop financial projections? Developing financial projections is one of the most critical steps in planning a business. The Business Forecasting Model is a hands-on tool that an entrepreneur can use to quickly and accurately develop these projections for his or her business. For example, the model will give the entrepreneur the ability to input revenue, sales volumes, expenses, and financing cost estimates into a spreadsheet and see how long it takes the business to become profitable. Once these basic numbers are input, the entrepreneur can begin doing what-if analyses to see what happens if the business and sales volumes are different than expected, expenses are higher than expected, or it takes longer for the customers to pay than anticipated. Once this is known, an entrepreneur can decide if the return the business will generate will be worth his or her investment of time and money into the business. Q16: Where can I buy Finance Without Fear? 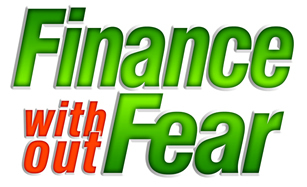 Finance Without Fear is available both as a book and e-book. You can buy it from our website at www.financewithoutfear.com, from online retailers such as Amazon.com, from your local bookstores such as Barnes & Noble or Borders. Additionally, we have made Finance Without Fear available as an e-book that you can download for use on your computer or e-book reader. Q17: Where can I buy the Finance Without Fear Business Forecasting Workbook? Like the book, the workbook is available through our website, online retailers such as Amazon.com, and your local bookstore. We've also made the workbook available as e-book so you have the opportunity to download the workbook and business forecasting model and get started forecasting or analyzing your business right away. Why did you write Finance Without Fear? Why are people afraid of Finance? How do you remove the fear of finance? Can you succeed in removing the fear of finance? Who is the target audience for Finance Without Fear? Do you need an MBA to understand the book? In Finance Without Fear, you have built the book around several sample companies. Tell us about these companies. You talk a lot about competitive advantage in the book. What does finance have to do with competitive advantage? I don't know anything about finance, what will I learn by reading Finance Without Fear? If I've already been running my business for many years, is there anything new I might learn if I read Finance Without Fear? If I'm taking a finance class and the professor has assigned a big, expensive finance textbook, will I get any value from reading Finance Without Fear? If I was looking at a business for investment purposes, would Finance Without Fear help me with this as well? There is a companion workbook to Finance Without Fear; what's in the workbook? How can the Business Forecasting Model help an entrepreneur develop financial projections? Where can I buy Finance Without Fear? Where can I buy the Finance Without Fear Business Forecasting Workbook? Copyright © 2010 - 2011 Institute for Finance & Entrepreneurship. All rights reserved.